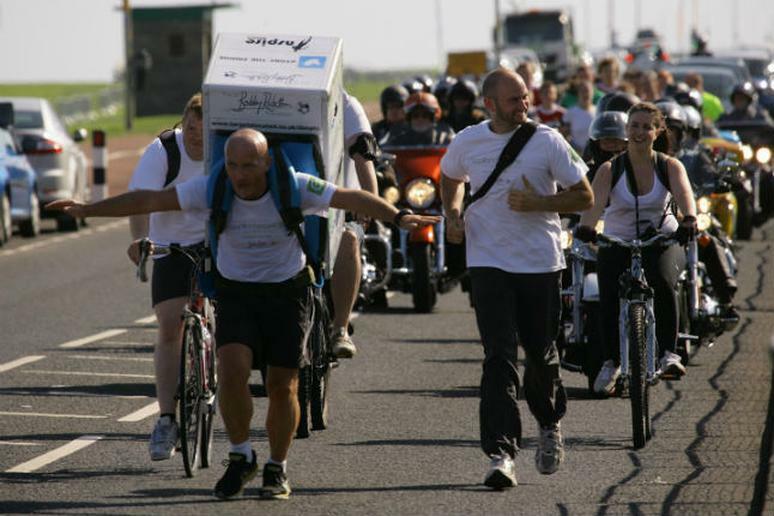 Tony Phoenix-Morrison completed 30 half-marathons in 30 days with a refrigerator on his back. Are traditional races old news? It’s not just the rising popularity of events such as the Warrior Dash or The Color Run that got our attention. In the last few months, the attempts of some oddly ambitious runners to spice up traditional events have made us wonder if the old 26.2 mile and half-marathons haven’t become passé. Take Tony Phoenix-Morrison, for instance. The grandfather finished 30 half-marathons in 30 days with a refrigerator on his back. "I'm feeling honored to be able to carry out this challenge,” he said in an interview with theguardian. "It represents the daily struggle people with cancer have, and the struggle to fight cancer." Then there’s the apparel. So many people opt for Nikes or Fivefingers, but how about flip flops? Well, that’s never been done. For this reason, Keith Levasseur will attempt to run Saturday's Baltimore Marathon in footwear normally reserved for the beach. If he’s successful, Levasseur will go in the Guinness Book of World Records as the first. Guinness set up a few interesting guidelines: If a flip flop falls apart, the record attempt is over. Also, if a flip flop comes off, Levasseur must retrace his steps to the spot where it happened, put the flip flop back on and resume the route. And finally, there’s Steven Manofsky, who tried to beat the world record for the fastest marathon time while wearing a suit. It was an unlikely attempt, given that his PR sans suit wasn’t even fast enough to beat the suit record. But we appreciate his ambition. So runners, keep up the creativity. We are eager to see what’s next. H/T Runner’s World and theguardian.